For today’s Follow Friday I suggest that you follow fellow RD Andy DeSantis whose goofy antics on social media have fast earned him a number of devoted followers. He tweets at @AndyThaRD but where he really shines is on Instagram. He has his fair share of the obligatory food pics and selfies but he also started a challenge a little while ago asking people to post photos of themselves striking yoga poses with vegetables. Andy is serious about supporting new RDs and promoting a healthy lifestyle; he just knows that you can’t take anything (including yourself) too seriously in this business (life?). 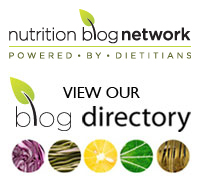 He recently began featuring blog posts from dietetic students on his blog. The most recent post features a recipe for vegan minestrone from Rachel Asbury, perfect for the cooler temps that are about to hit. Tags: Andy DeSantis, andythaRD, blogging, dietitians, Dudes Talk Nutrition, follow friday, Hearty Nut, Joel Feren, RDs, social media | Permalink.